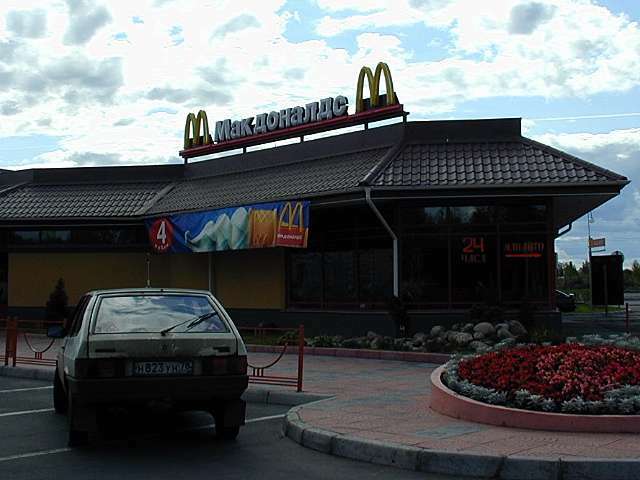 I hadn't planned to visit Russia. It just sort of happened. Faced with a six week sabbatical and enough airline miles to go most anywhere I wanted, I began investigating tours of Norway. I was also interested in seeing Tallinn in Estonia, after the recommendation of a Finnish colleague. 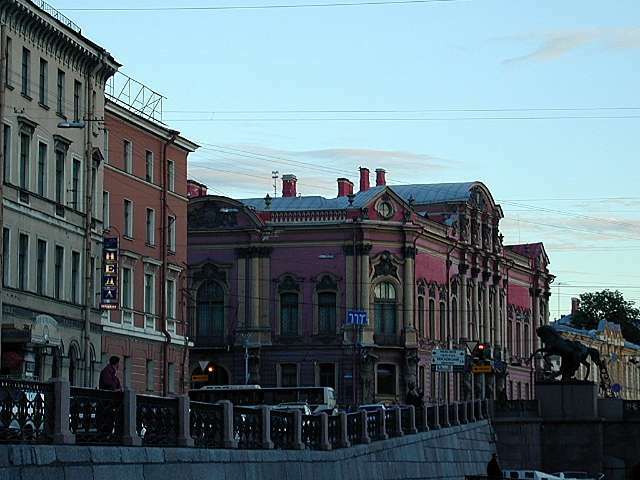 And I found a tour that included both, one which also involved three nights in St. Petersburg. So, with the memories and fears of my Cold War childhood firmly under control I found myself on my way into the land of my grandparents and of my country's one-time great adversary. Our arrival into the country was everything I could have expected. It took three hours for our coach to make its way across the border. 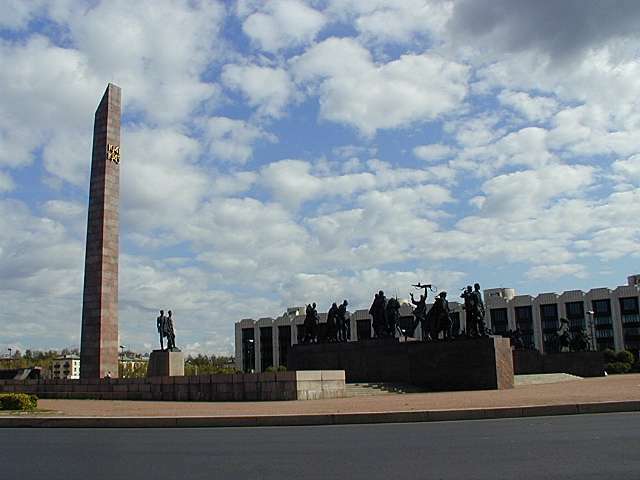 The first hour and a half was spent at the Estonian border at Narva, where a single official two finger typed the relevant information from forty-six passports into his computer. Then, finally, across the bridge into Ivangorod. Where we waited while our tour guide negotiated with the Russian officials, who were insisting that we remove all of our belongings and carry them through for inspection. Although, we were led to understand, for a small compensation our way could be eased considerably. That compensation was not forthcoming. And eventually the official decided that examining forty-six sets of luggage just wasn't worth the effort. Our first stop across the border was for a delayed picnic lunch. Our picnic grounds were a lay-by at the side of the road (I know, that's what a lay-by is!) 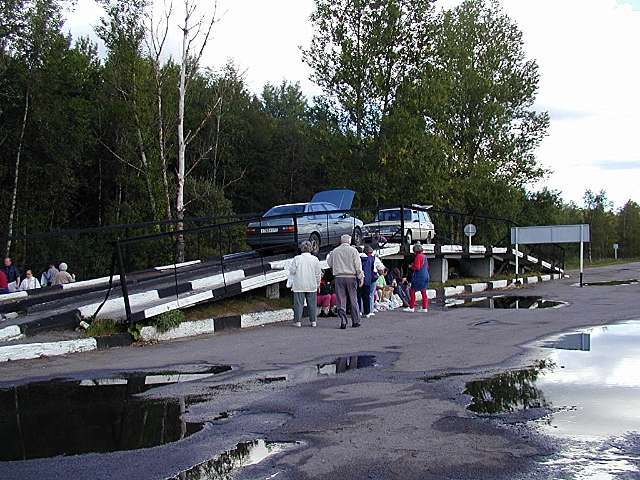 with a ramp the locals can use to get under their cars to work on them. We stood around, eating our Estonian bag lunch, watching the decrepit trucks and buses drive by and wondering just what we'd gotten ourselves into. Soon we were back on the road for St. Petersburg. And then came our next incident, as we were stopped for speeding by the dreaded traffic police. 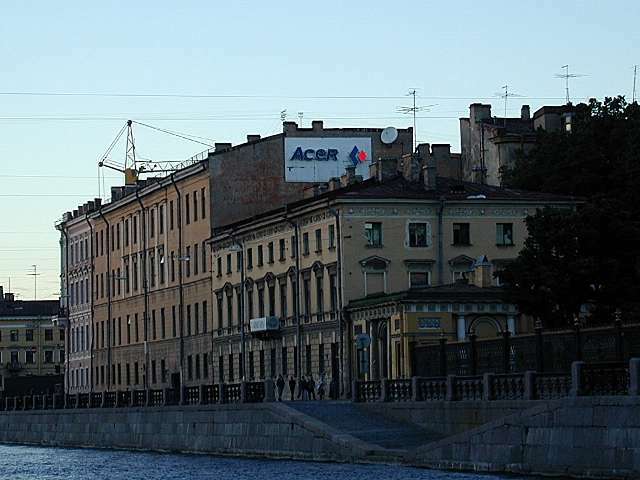 Again the negotiations, which began with an $80 fine and a threat to revoke the driver's license and ended when he agreed to pay a more reasonable fine of 73 rubles (about three dollars at current exchange rates). Our first activity after checking into the hotel and having a quick dinner was a tour by water of the city. 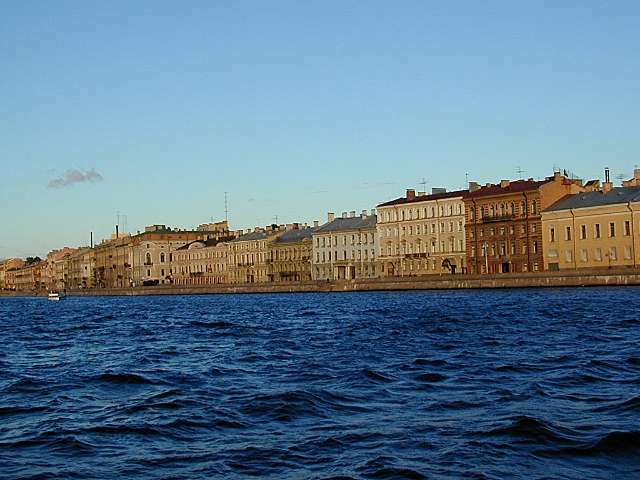 St. Petersburg is situated on the Neva rivers, which was supplemented by canals to make it easier to transport goods and, I imagine, to give waterfront views to more of the city's wealthy. A boat is a great way to see the city. The views are spectacular. Besides, you stay far enough away that you don't notice the dirt and the deterioration nearly so much. I remember stories of visits to Russia during the Soviet days, how you were taken to an endless series of giant stadiums and tractor factories. These days the tours focus on churches and palaces. 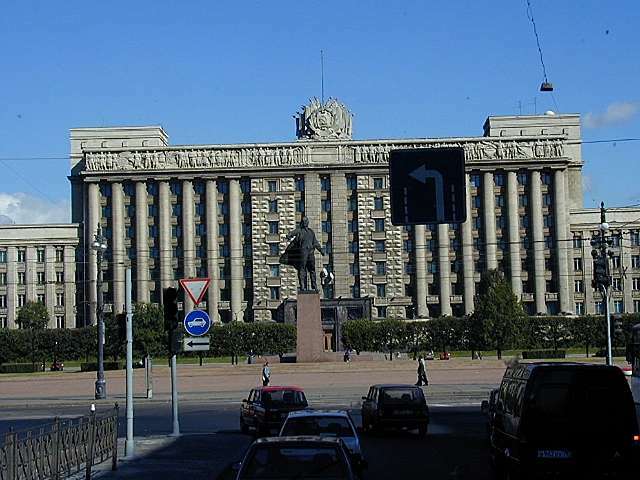 The guides are meticulous in their descriptions of which churches were left open to allow Stalin to claim that religious freedom was still protected in the workers' paradise, as well as which churches were used for storage or as museums or even as ice rinks. 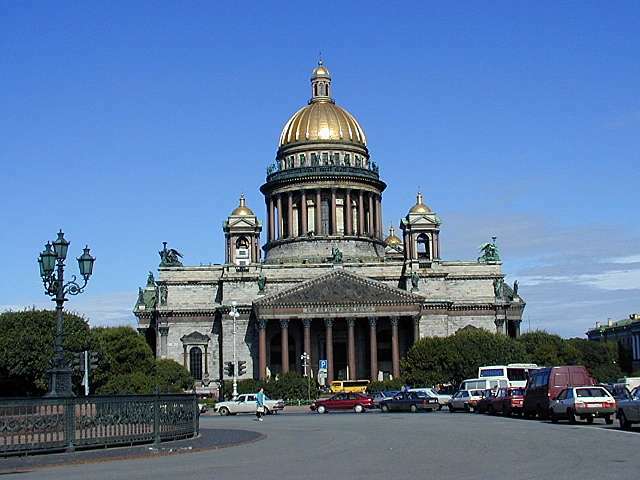 The example on the left is St. Isaac's Cathedral, begun in the early nineteenth century under Czar Alexander I. 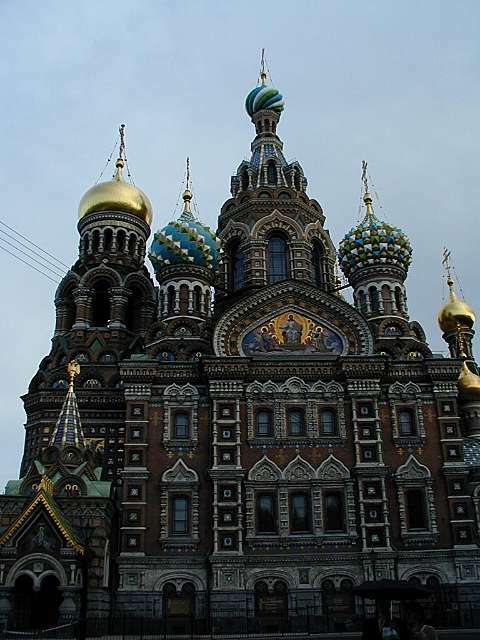 The more fanciful number on the right is called the Church Of Our Savior On The Spilled Blood; its location marks the spot where Alexander II was assassinated by revolutionaries. Sometimes it's not good to be king. So much for churches. 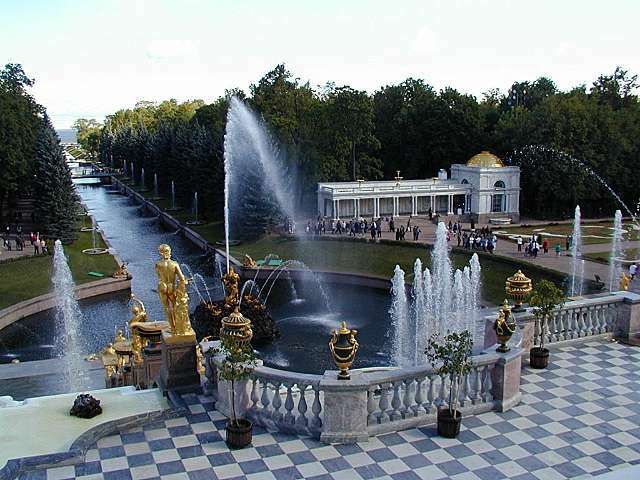 No visit to St. Petersburg would be complete without a visit to Peterhof, site of Peter The Great's summer palace. Styled after Versailles (which, to my shame, I have never seen), the palace grounds are covered with fountains of every shape and size. 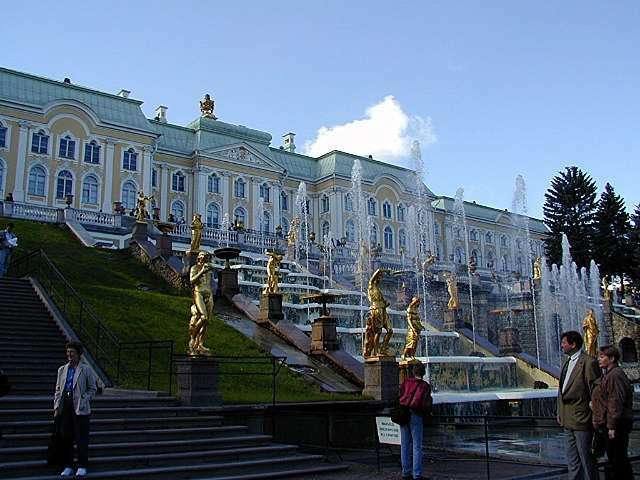 The biggest display is at the rear of the grand palace, the Bolshoi Dvorets, where dozens of cascades decorate the canal that leads to the Gulf of Finland. 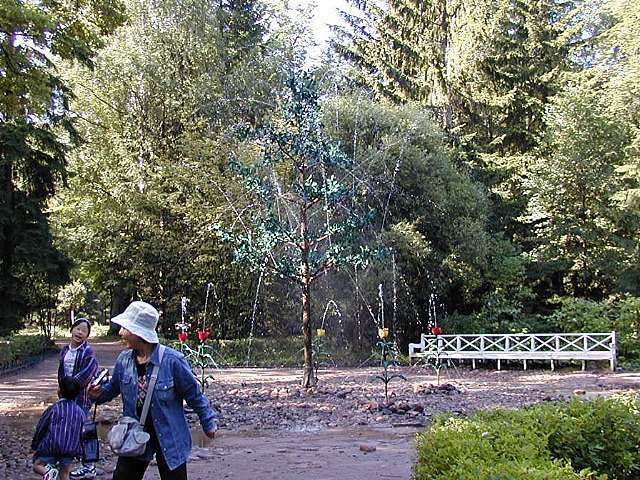 Not all the fountains are dramatic; some are just fun. 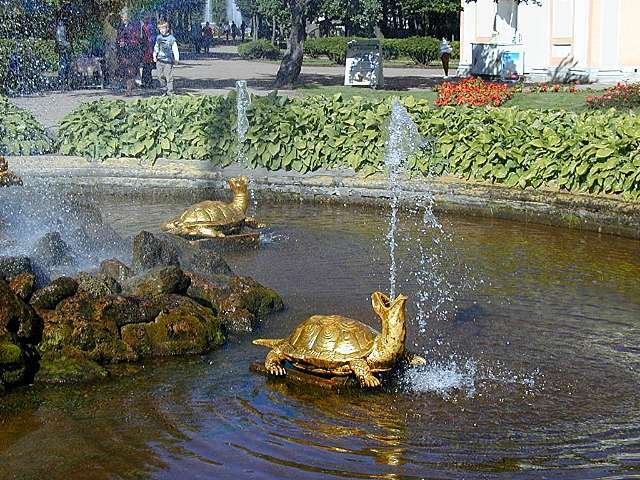 Like these turtles that surround a figure of Neptune. When they first turned on the water the turtles looked like they were gargling! And then there are the trick fountains. Step in the wrong place and a spray of water comes shooting your way. So of course I did. Twice. What's the point of being king if you have to look at the same walls every day? 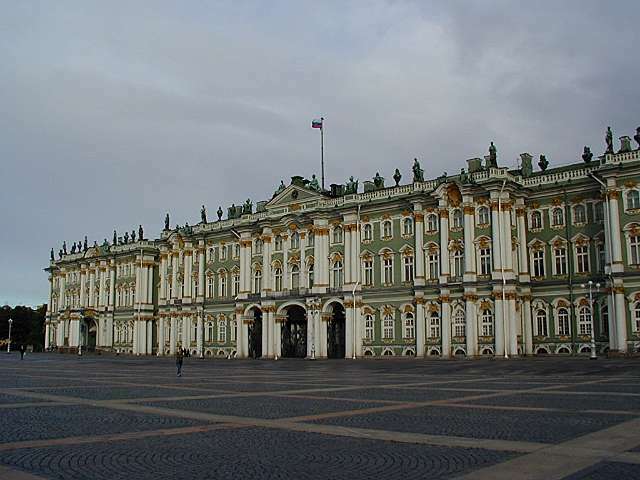 Not a problem for the Czars; when the mood took them they could go from the Winter Palace in town (now part of the Hermitage Museum) to the Summer Palace at Peterhof to the magnificent Catherine Palace in the town of Pushkin. 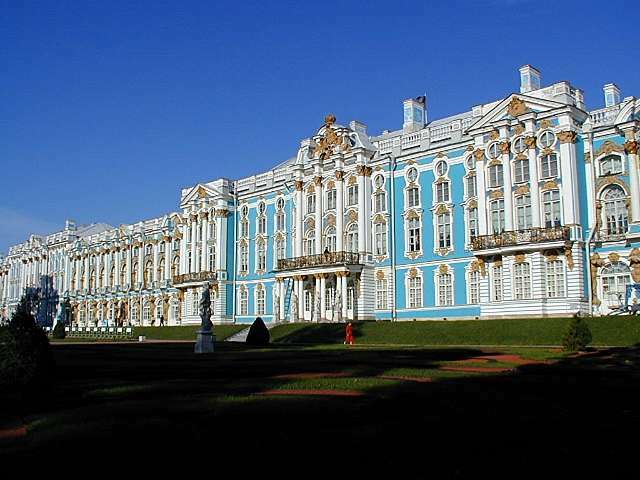 The Catherine Palace is probably my favorite. Not so grand as the Summer Palace, it has a warmth and a peace to it that appeals to me. It also had better shops at the end of the tour than the other two, but that's not why I like it. Really! 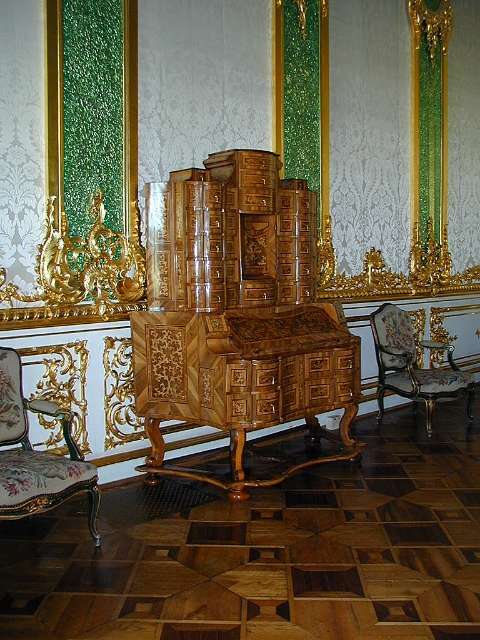 Part of the appeal of the Catherine Palace is inside, where you get a glimpse of the place as it was for the Czars. 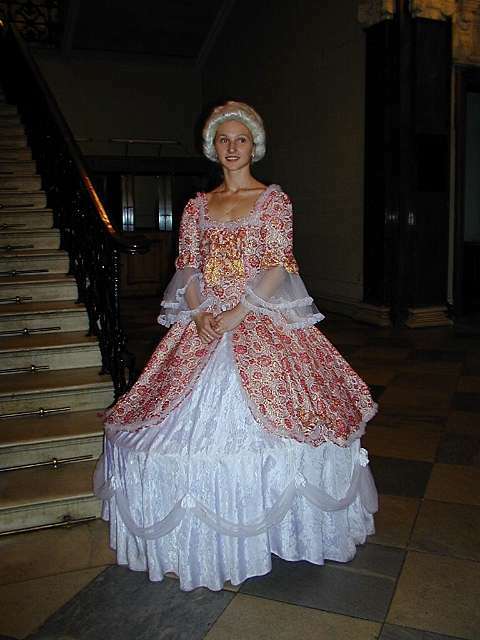 Each room is decorated in a unique style, from the magnificent inlay of the parquet floors (requiring us to wear these slippery protective gear over our shoes) to the fanciful ceilings. An incredible amount of work has been done to restore each room, undoing the damage done by the German Army during its residence and abrupt departure. Not all our time was spent touring palaces and museums. We also indulged in the odd cultural pursuit. One night it was Swan Lake at the Alexandrinsky Theatre (not a high point, although the Russian Champagne at the intermissions certainly helped). 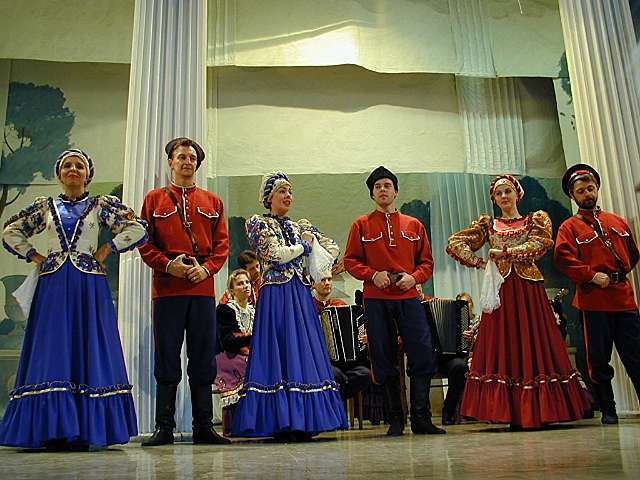 The next it was a Russian Folklore show in a former private mansion, complete with balalaikas (yes, they did play Lara's Theme from Dr. Zhivago), traditional singers and dancers and more acrobatics than you'll see in the average circus. Now this was more like it! And the vodka and caviar at intermission was good too. 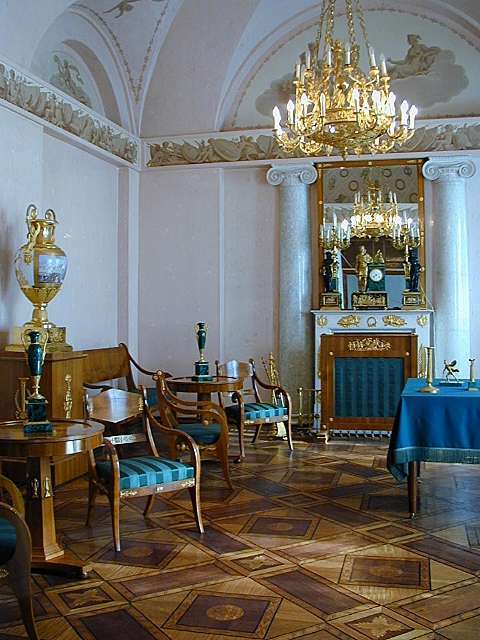 This was also the place where I bought the whiskey flask with the KGB insignia. Just the thing for those long Fleming-inspired train journeys.